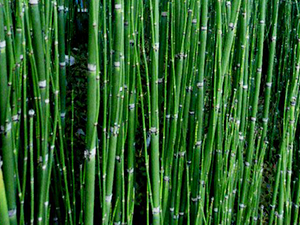 The Tokusa-iro, it is a deep green with a bluish stalky Equisetum. In order to write as “horsetail” evergreen grass perennial ferns, including silicate, stiff stems are rough firmly, horsetail has been used to or polished Dari Togi-i and wood and dried. Also, because of the bitter green calm, is popular with middle-aged costumes and samurai, this color name has already appeared in the Kamakura period. There are “under the Kariginu Equisetum color, wearing a belly band of light green Children per room” and the “Tale of the Heike”, favored by clothes color of the elderly and samurai of the Middle Ages, it was a fashionable color the days of Motobun of Edo it is said. The color of the prone, there are “table, black blue, back, white”, “table-light green, white back,” and.